« A Little Color In The Trees! Lots More Color In The Hills! Beautiful weather! Temperatures have been in the 60s. One morning it actually felt cold for a while as it was overcast with a little wind int he morning. More of the same expected. 60s to even upper 50s by early next week. Today and tomorrow there is a possibility of some showers. Otherwise, clear through next weekend. Generation schedule changed yesterday! Instead of our normal no generation in the morning then some in the early afternoon, we had units on at 6:00 a.m. and they ran all day. This morning, units came on at 7:00 and are scheduled to be on most of the day. Although they have four units going, right now, it is running at the equivalent of not quite a full two units. Can’t wait to see what they do tomorrow! Other than at the outlet, fishing has been tough. And there are even days when we hear from the folks who fish the outlets, that they have had a tough day. catching on the CQ streamer and Holly was using a b-bug with a size 18 gray scud. Monday, Gina took Don, from Kansas out for the day. 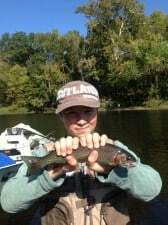 Another difficult day, but they caught fish on soft hackles when the water was off and then switched to the CQ streamer after the water came on at 3:00 p.m. 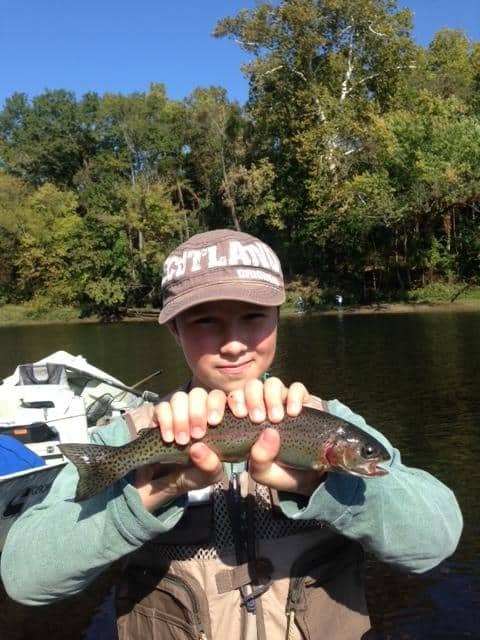 It was somewhat of a fish a fly day, but with enough chancing of the fly, you can catch a few fish! Jim on the water Monday with Warren and his daughter, Kim, from Arkansas. 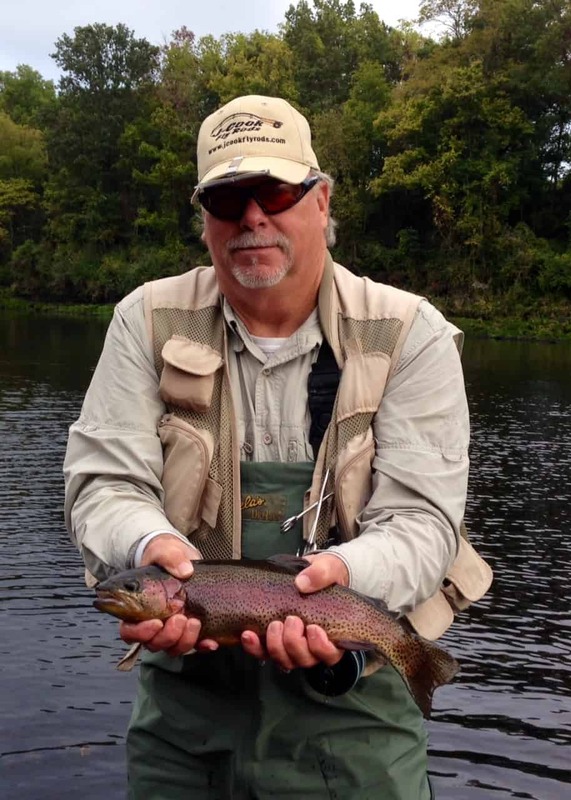 Another worker, but they caught a few fish on the CQ streamer. Tuesday, Carolyn had Mary Ann and Virginia from Springfield on the water for the morning. Little better day than the two to three prior days, but still worked for the ones we caught. It was a day of really pretty fish. 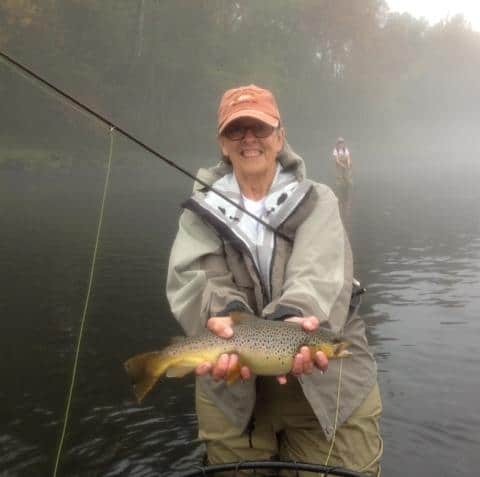 Both ladies caught a brown along with their nice size rainbows. Dave and Tracey, from Michigan, fished with Jim Wednesday. It was like old home week with them being from Michigan. David is an experienced fly fisher and wanted to get his wife more interested in fly fishing. If we heard correctly, Tracey landed the most fish. Best patterns were the CQ streamer, red midge and the hot hare’s ear nymph. Steve, from Ohio was out with Stan. They had a pretty slow morning, but when the water came on, so did the fish. Most of them were caught on the big ruby. 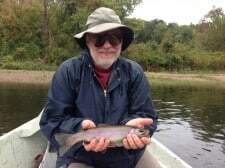 This entry was posted on Friday, October 18th, 2013 at 2:43 pm	and is filed under Fishing Reports. You can follow any responses to this entry through the RSS 2.0 feed. You can leave a response, or trackback from your own site.